Arsenal's 3-1 loss to Monaco on Wednesday has left many questioning Arsene Wenger's tactics yet again. But, let me ask you: at home, in the first leg of a two-legged tie against a team with one of the stingiest defenses in the world, what are you supposed to do? In my match preview, I suggested you have to attack. This is the game where you are more likely the score the precious few goals you need to win the tie. 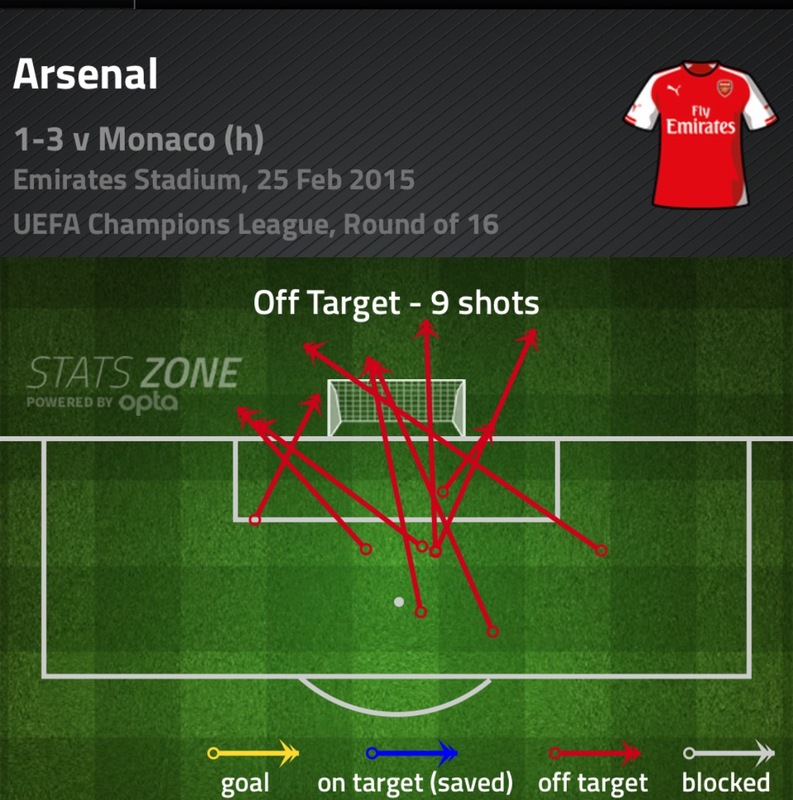 Arsenal created more scoring chances than expected, but wasted nearly all of them. Arsenal's defense crumbled in "oh so Arsenal" fashion when under pressure. That's it. Arsenal's tactics were not wrong, they just didn't work. If Olivier Giroud hadn't been an omnishambles, we'd be having a different conversation right now. That means it's mostly #2 that should keep you up at night. But that's a discussion for others to have. Also, I firmly believe that things like this should not keep you up at night. Anyway, Arsenal return to the league against an Everton side that have struggled domestically this season but are now the only English side left in the Europa League knockout phase (which might be a bad thing.) The Gunners sit pretty in third and control their own destiny, but anything can happen in the remaining 12 games, especially now that Liverpool and Spurs have crashed out of Europe. Back to basics and all that. I would love love love to see a defensively calm and controlled 1-0 win on Sunday. Oh, I'm sorry, is this distracting? As I'm typing this, it's only 24 hours or so after "The Unpleasantness," so there isn't much in the way of team news (and there isn't any updated news for Everton, who are literally about to kick-off in the Europa League as I'm typing this sentence.) So, these next two sections are going to be... worse... than usual. Anyway... Alex Oxlade-Chamberlain seems to be back! That was the only pleasant surprise of Wednesday. Jack Wilshere might make a cameo from the bench too. Aaron Ramsey will still be short and it's at least another month for Mathieu Debuchy, Mikel Arteta, and Abou Diaby. Possibly forever for the latter. As for the squad, your guess is as good as mine. Was Wednesday's performance enough for David Ospina to be dropped again? I have no idea! Will there be some rotation? Probably! Arsenal do have another midweek match coming against QPR, a team that'll be well-rested after having the weekend off. Predicted XI: Hastily Constructed Brick Wall, Bellerin, Koscielny, A Rock, Monreal, Flamini's Sleeves, Coquelin, Three Alexis Sanchezes (Sanchi? ), Omnishambles. In injury news building up to Everton's match yesterday against Young Boys, Steven Pienaar and Leon Osman both faced fitness tests as they returned from knee and ankle injuries, respectively. Osman made the bench, but Pienaar did not. Both featured for the reserves last week. Christian Atsu missed out through illness and could miss Sunday as well. Aiden McGeady, whose name could only be more Irish if his middle name were Paddy (it's John, FYI,) did not play at all in the month of February with a knee injury. Bryan Oviedo is expected to still be out with a hamstring injury, which he suffered in the first leg of the Europa League Round of 32 against Young Boys. Tony Hibbert is likely out with a muscle injury. As you can see in the pictures, by this point of typing the preview I've gotten to where Lukaku scored eight more goals... After I typed that, he came out for the second half but limped off after three minutes... Hmmmmmmmm. Predicted XI: Howard, Jagielka, Coleman, Stones, Baines, McCarthy, Besic, Barkley, Naismith, Mirallas, Lukaku. Young Boys clearly stole their kits from Dortmund. This, by the way, was Lukaku's 44th goal of the tie. To be honest, of course I cannot actually speak on behalf of Everton supporters about their clubs form, but the Toffees are just six points clear of relegation. In 12th place, they have yet to win on the road this season against a team that is above them in the table. They have won just two of their last 14 league matches. A large portion of Everton's struggles this season have come down to the ol' European hangover. 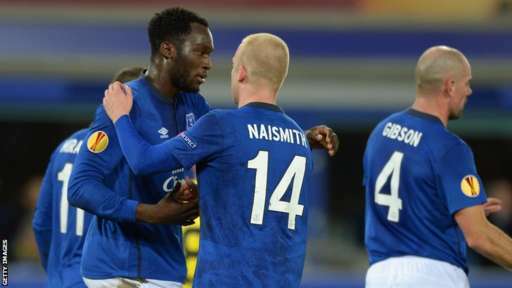 The Toffees have taken eight of a possible 21 points (38%) from weekend matches that followed Thursday night Europa League matches, and six of those eight points were earned against Burnley and QPR. Compare that to Arsenal's 14 of a possible 24 points (58%) from their weekend matches following Champions League games; they've lost only two of the eight, both away from home. Arsenal have earned 61.5% of possible points in the league overall this season, so their success rate following European matches is not significantly worse than their season average. Everton's season average is actually worse overall, at 36.8%, which could imply that the fixture congestion is having a lingering effect. Olivier Giroud applauds the fans after the 2-2 draw in August. around on a leg that's broken. The reverse fixture, played back in August during the second week of the season, started out much like last season's match at Goodison Park, as the Toffees jumped out to a 2-0 lead through Seamus Coleman and Steven Naismith. Arsenal left it late, but an 83rd minute Aaron Ramsey goal and 90th minute Olivier Giroud goal earned Arsenal a gutsy point. The luster was lost a bit, however, as Giroud broke his leg on an innocuous attempt to block a clearance and the Frenchman went on to miss three months. Last season, Arsenal and Everton played twice at the Emirates. In the league match, Arsenal led 1-0 through Mesut Ozil but conceded an equalizer just four minutes later and were resigned to a 1-1 draw. In the FA Cup, Arsenal won 4-1 with goals from Ozil, Mikel Arteta from a penalty he had to retake, and two from Giroud off the bench. Everton are winless in their last 20 trips to the Emirates/Highbury, dating back to January 20, 1996. They have drawn each of the last two league meetings in North London, however, and four of the last eight. "Is that the right guy...??? Yeah, totally. Nailed it." The referee is West Midlands-based Andre Marriner. Arsenal's recent history with Marriner is pretty well known after he sent off the wrong man in the 6-0 loss at Chelsea last season. Arsenal have seen Marriner once this year for the 1-0 win over Southampton in early December. Kieran Gibbs remained on the bench for that one, while Alex Oxlade-Chamberlain was removed for Olivier Giroud in the 65th minute. Three days after that match at the Emirates, Marriner took charge of Everton's 1-0 loss at Manchester City, his second Toffees match of the season. In October, he was in the middle for their 3-1 win over Burnley at Turf Moor. John Painting is a contributing writer to The Modern Gooner and exhibits the properties of not only particles, but also waves. You can follow him on Twitter @zorrocat where he posts with a frequency of [m0c2 / h] / sqrt (1 - [v2 / c2]), where c, of course, is the speed of light.